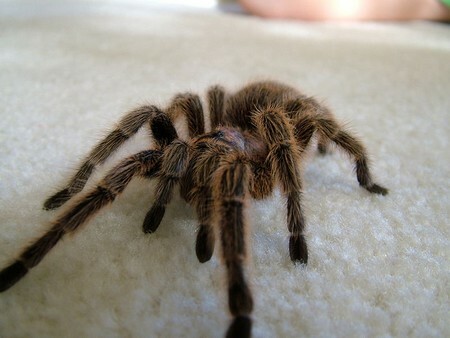 Many tarantulas have small geographic ranges and probably don’t occur in large numbers in the wild. They also face the usual problems tropical animals do, including loss of suit­able habitat due to conversion of forests to pastures and savannas to villages, as well as total flooding of huge areas by hydroelectric dams. Add to this a sometimes massive col­lecting of attractive species for the pet trade, and you can understand why some tarantula species have become greatly reduced in numbers in the wild. Even in theUnited States, where native tarantulas are not that popular as pets, large numbers lose their homes to land conversion, and ines­timable numbers of males are killed each year by automo­biles as they cross roads while looking for females. In 1985, the Convention on International Trade in Endangered Species (CITES) listed the very popular and colorful Mexican red-knee tarantula (Brachypelma smithi), which effectively allowed Mexico to pro­hibit exportation of the species and its relatives while receiv­ing cooperation from the United States and other countries that recognized the CITES treaty (http://www.cites.org). Red-knees virtually disappeared from the market except for those smuggled out ofMexico (a practice that continues even today) and older specimens already established in col­lections. Fortunately, this species has females that live for more than twenty years in captivity and breed fairly easily, so within a few years the first tiny captive-bred spiderlings became available for sale. They sold at higher prices than adults had sold a few years earlier, but they found a good market and became an incentive for many breeders to try their hand at captive breeding a variety of tarantulas. Today, perhaps about twenty-five species are bred on a regular basis, with spiderlings available for just a few dollars even when very expensive imported adults are available. 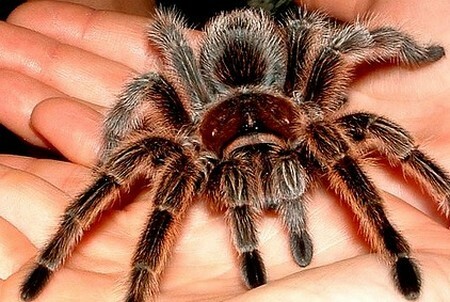 By all means, start with captive-bred tarantulas of one of the common species. The most common ones generally are also the most attractive and docile, and they make the best pets until you gain more experience. Captive-breds usually are healthy, are of known age, and often have been sexed by experts based on details of their shed skins. Imports may be dehydrated and carry bacterial infections and intestinal worms; little may be known about how to establish them in the terrarium. Unfortunately, the cheapest spiderlings are tiny and look nothing like the adults; they might be hard to tell from spi­ders you notice around the house. Each spiderling needs its own small cage and careful feeding. It grows slowly, with the males often taking three to five years to mature and females taking six to eight years. They may not resemble the adults until they are three or four years old. However, you can house many different species in a small area and spend relatively little money for what, with patience, will become a great collection of beautiful adults.